Woods: Maple, Padauk and Wenge. Good work. I like this design. I’m probably gonna have to steal it. -- Cats, beer and wood...perfect. WOW that is a real eye catcher, Nice work on it!! Hey Jim Ddnt feel bad about stealing this design, this picture, is stolen and mustang is passing it off as his own work. Google search the image. You will see it all over pintetest. Magnificant colours and stripes pattern. Let me just say, I do not post projects that I have not completed, and, I do not post photos that I have not taken. I have no idea what Pintrist is, nor do I care. I have no idea how somebody else posted my photo and claimed it as their own, nor do I care. 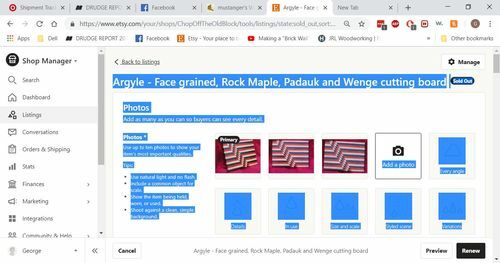 That being said, here is a screenshot of MY original Etsy listing (ChopOfftheOldBlock), with two additional photos of the item, that sold and was very positively reviewed. I have sold two of these items and have a third upstairs (Purpleheart in place of Wenge). If you would like to see it up close and personal…show me the money. Oh, and thank you everyone for the kind comments. Anyway, It’s a beautiful board. Great build and eye catching combination of materials.